Are you one of those applicants who have applied for the Delhi Development Authority Housing Scheme 2014? Then good news for you as DDA rolled out the tool to check the status of your application. You don’t have to depend any more on broker or anyone else to know the status of your application. Either you have applied online or offline you can easily check the status of your application. If you have applied online for the DDA housing scheme enter your 7 digit application number or if you have applied offline then fill your form number in the search box to check your status. 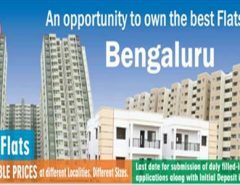 Click on above mentioned DDA link to check the status of your application. Simply fill your application ID number of Form number in the search box. After filling your Application / Form No. click on search button if the correct results are displayed, it means your application has reached to DDA. In case of message “No Date Found” is displayed, the date of the applicant has not been supplied by the bank to DDA. In such case applicant should either wait for few days or contact the concerned bank through which application has been filled online or physically. Instead if it shows “No Data Found” then wait 2-3 days or contact immediate to your bank through which you have applied for the same. 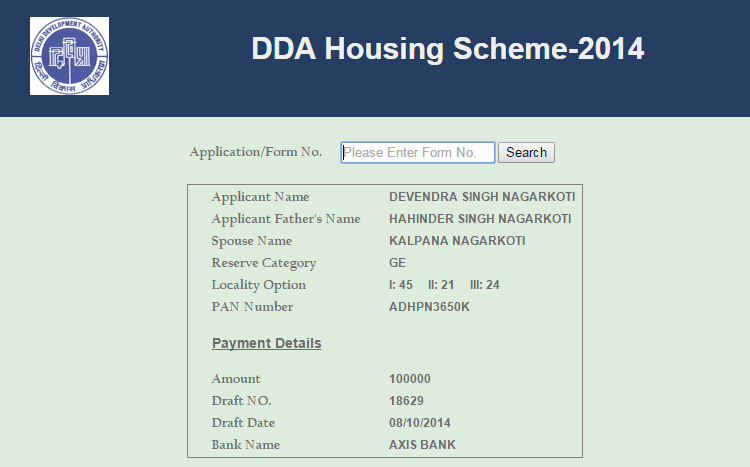 My sons had submitted the Application to DDA, for the said Housing housing and it has been received by the DDA. I feel grateful to you for this information. Thanks Mr. Jairath you made my day with your precious comment I am so glad to know that you find it worthful. Hello Kapil,Maine apna dda ka form online bhara tha aur application status check kara to record not found show ho raha hai now what I should do please advise. Rahul please wait for 1-2 more day and recheck with your application or form number whatever you have. If still you it showing “Date Not Found” please contact to your bank through you have applied for DDA flats. sir, i had made draft from SBI but submitted the form in Central Bank, so is it right? Toll Free Helpline: 1800 110 332 of DDA. Can i check the status by name of the applicant? Unfortunately DDA did not provided any option like that if you want to check the status of applicant then you must have his/her application number or form number without it you can’t check the application status. Personally I recommend to visit first Bank premises area as soon as you can do because DDA soon going to draw its results. Please visit to SBI branch premises through which you have applied without any delay if possible visit tomorrow early morning because dda soon going to result and if the status showing “No Data Found” is really serious. Personal recommendation don’t be lazy visit tomorrow SBI branch if problem not resolved you can also contact to DDA toll free number : 1800 110 332. As per your query I think you have applied through offline mode then you must have Form No. you can simply use this form number to see your status on DDA website as said above in the article. If you don’t have the Form No. as well then take the help of branch through which you have applied they will surely help you in this matter. Dear sir I am not able to check my dda application online. my app no. is 0220214.& i am trying dda toll free no. but no. is not exist. so please help me on urgent basis. Your application is received the DDA and showing amount of Rs. 1 Lac as well you can check your status yourself on DDA official website here http://dda.org.in/HousingScheme2014/DDAScheme14.aspx. I have submitted my form in PNB, but my details are not showing correct on DDA website. Someone else details are coming on my Form number. Regarding correction for this i have email, physically go to bank but till nothing has happened. Suggest me what to do. Sorry Mr. Ajal but DDA already given time for 2 days 31st October and 1st November to correct the details applicants can rectify the data through Bank which they applied. Sir , kya mai apne name se y check kr skta hu k mera form dda ko receive hua h k nhi…plz help me sir or dda ka result kb a rha h…..? Sir my application no. 0858547 showing status No data found . what should i do. Bank has sent my data to dda. DDA has not confirmed the final date of draw result that’s why I also could not confirmed you but within a week you can check the official website for the list of lucky draw winners and I also update it on my website as well. Kapil, I came to know about checking the form status yesterday. When I checked it showed No Data found 0020984 is there any way to check. I am shocked that it is not displaying any details & feeling bad that I did not kept a track of this. Please help. My application no is 0328842, I just want to know that in my status Draft Coloum shows 0 and rest coloum are correct. So my application will be accepted or not. rest are correct. this application will be accepted on not. As I can see your both the applications has been received by the DDA only and payment also received by the DDA only draft no. is not displaying. This check application link isn’t working today. Is there any alternative so that i can check my application details. Sorry dear there is no any other way to check the application status. This link to check application details is not working. Do we have any alternate to this? Sorry Karan, I am not sure why the link is not working may be DDA planning to draw result tomorrow it could be an reason but still I am not sure why the link is not working after the 5.30 pm. The above mentioned link to check dda application status not working after 5.30 don’t know why but there is no any other way to check the application status online. Hi Kapil,First i am giving thank you for all above helping reply, Now could you tell about the draw date & time or any idea about it. Again DDA embarrassed the people and extend the draw date and may be draw result by Saturday or Monday. This link was provided by the DDA to check the application status and it is not working from yesterday after the 5.30 may be DDA has closed it and unfortunately there is no any other way to check your application status. So keep patience and wait for the draw result may be you found your application number in it. Also I have tried in office hrs but it doesn\’t open. Sorry Chandan but DDA has closed that page that’s why no one can access it earlier several people checked their result on above mentioned link but it is not working from yesterday because dda has announced to draw result today. Hi Kapil, can you please tell me whether the URL to check the status is still working. As i am trying to check my application online but this link is not responding. If you have seen other viewers query you can found the answer the link to check application status is not working from 13 November evening and there is no any other way to check the application status at the moment. Already given answer for the same query above please see. Please guide me how to see result of 2014 DDA scheme. There is no any option to check the application status at the moment Rishabh because the provided link by the DDA is not working. Dear sir, i deposit the DDA form application no.0907079 in Najafghar ICICI Bank on 22/09/2014 ,now when i am checking on DDA site it is showing document not found ,can you help me i also write the same problem to bank but still no reply. The simple meaning of this that DDA has not received your application as you have already write email to Bank they will revert you either visit the Bank premises or call DDA helpline number 1800 110 332 or contact ICICI Bank – Mr. Gaurav Kishore: 011-33667777/41718000, 30278842 hope it works for you. I have applied for DDA Flat 2014 scheme through online payment wich was been deducted from ICICI netbanking ; my provisional id is TMP2014666 but I didn’t receive application number or might be it\’s deleted through SPAM. Please advice whether we can get it again or any other way to check my application status. Kinldy reconfirm me the site where i can able to see the application no is submitted or not..
hi,my name is not there as per the application form no entered, however its showing same name and father\\\’s name in the PDF list in a different application nois it a co-incidence that someone got same name and father\\\’s name as me ? Poonam please visit the DDA office premises for the same they will surely sort out this issue if it showing your name and your father name but application number is wrong they you must visit the DDA vikas sadan office. So that, can grab the flat. My name is there in the draw but there is a spelling mistake. Instead of ‘A’ in my name they have typed it as ‘V’. What can be done in this case? You need to contact to authority for this issue only they can do the needful in this case. Would like to congratulate that you get the flat for further please visit the DDA office premises. My name is not available in DDA 2014 draw list in aloted or waiting list. i have done payment through online. what is procedure for refund of my payment. its automatic refunded or some procedure.